Each Box contains Two Autographs, One Memorabilia Card, and One PVC Insert!! 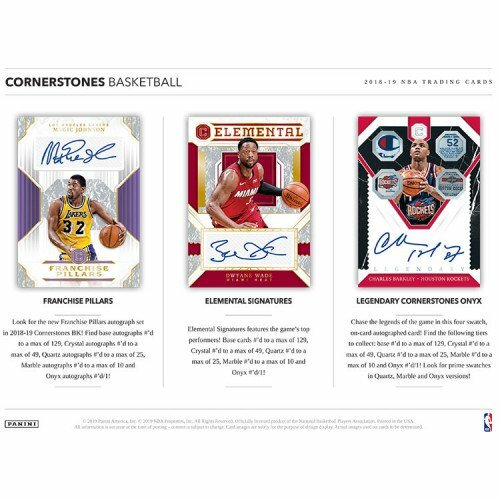 Look for the popular Rookie Cornerstones cards with four jersey swatches and an on-card autograph! Base #'d/199, Crystal #'d/75, Quartz #'d/49, Marble #'d/10 and Onyx #'d1/1! Chase the Franchise Pillars autograph cards in the following formats - Base #'d/129, Crystals #'d/49, Quartz #'d/25, Marble #'d/10 and Onyx #'d/1! Locate the elusive Memorabilia Super Prime containing hard-to-find game-worn jersey tags from the NBA's top players all #'d/1! Find the highly sought-after Downtown insert cards, boasting great graphics from the players' cities! 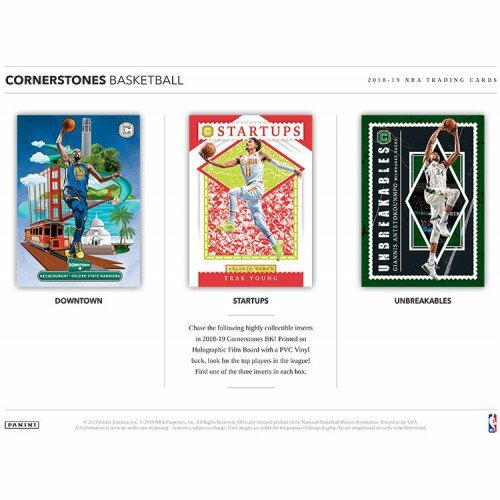 DOWNTOWN/STARTUPS/UNBREAKABLES: Chase these highly collectible inserts in 2018-19 Cornerstones BK! Printed on Holographic Film Board with a PVC Vinyl back, look for the top players in the league! Find one of the three inserts in each box. 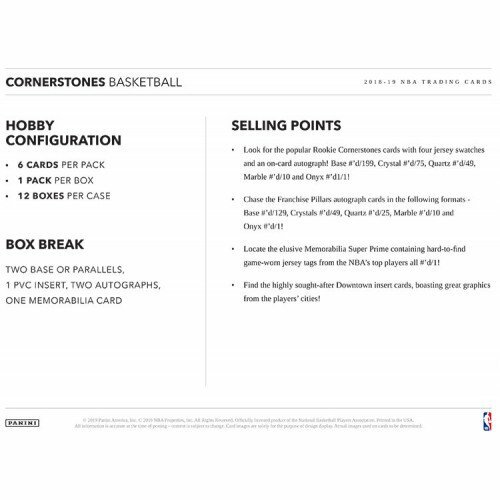 /ROOKIE CORNERSTONES ONYX: Collect the top rookies from the 2018 NBA Draft Class! Look for the following tiers: Base (#'d/199), Crystal (#'d/75), Quartz (#'d/49), Marble (#'d/10), and Onyx (one-of-one). Quartz, Marble, and Onyx all feature prime swatches of jersey! 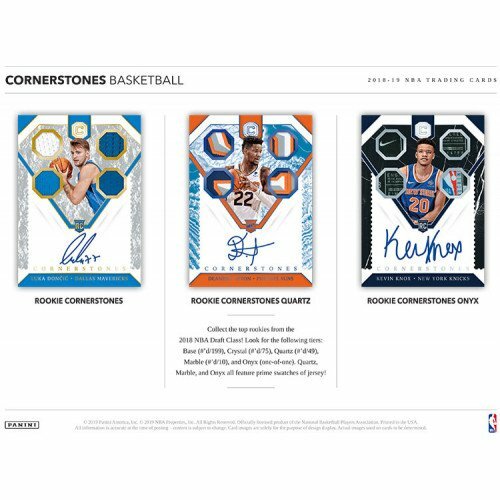 FRANCHISE PILLARS: Look for the new Franchise Pillars autograph set in 2018-19 Cornerstones BK! Find base autographs #'d to a max of 129, Crystal autographs #'d to a max of 49, Quartz autographs #'d to a max of 25, Marble autographs #'d to a max of 10 and Onyx autographs #'d/1! ELEMENTAL SIGNATURES: Elemental Signatures features the game's top performers! Base cards #'d to a max of 129, Crystal #'d to a max of 49, Quartz #'d to a max of 25, Marble #'d to a max of 10 and Onyx #'d/1! LEGENDARY CORNERSTONES ONYX: Chase the legends of the game in this four swatch, on-card autographed card! Find the following tiers to collect: base #'d to a max of 129, Crystal #'d to a max of 49, Quartz #'d to a max of 25, Marble #'d to a max of 10 and Onyx #'d/1! Look for prime swatches in Quartz, Marble and Onyx versions!